Award winning British soprano Raphaela Papadakis made her professional operatic début at Garsington Opera in 2014, which was singled out by the Financial Times as the “most attractive solo performance” of the show. She went on to cover the Nymph in Michael Boyd’s critically and commercially acclaimed production of Monteverdi’s Orfeo for the Royal Opera House, Covent Garden. An avid lover of contemporary music, Raphaela recently had the privilege of creating the role of the disfigured trainee geisha Kikuyo in Nicola LeFanu’s latest Japanese-inspired opera Tokaido Road at the Cheltenham Festival, and played the role of Anna in the British première of Šimon Voseček’s Biedermann and the Arsonists for Independent Opera at Sadler’s Wells in November, a production which was a sell-out success, receiving four stars in both the Guardian and the Financial Times. 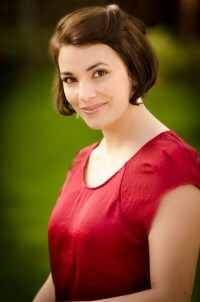 A committed recitalist, and a Samling, IMA and City Music Foundation Artist, Raphaela made her song recital début at Carnegie Hall in New York in 2014 following an Artist Residency at the Banff Centre, Canada, and last summer was a Vocal Fellow at the Stean’s Music Institute at the Ravinia Festival in Chicago. She is part of the Countess of Munster’s Recital Scheme, and a winner of the Making Music Philip and Dorothy Green Award for Young Concert Artists, both schemes which enable her to take her compelling performances to new audiences all over the UK. Her many awards and prizes include 1st prize at the Mozart Competition, the Clonter Opera and Audience Prizes, the Maureen Lehane Vocal Award and the York Early Music Festival Prize at the London Handel Festival. She was also a semi-finalist at the Kathleen Ferrier Awards, the Royal Overseas League Competition and the Das Lied International Song Competition. Raphaela studied at the Guildhall School of Music & Drama with Janice Chapman, where her roles included Susanna Le nozze di Figaro, AuroreLe portrait de Manon and Mrs Julian Owen Wingrave. Other roles performed whilst completing her studies include Gretel Hansel and Gretel for Clonter Opera, Pamina Die Zauberflöte for Woodhouse Opera, and a reprise of Mrs Julian for the Banff Centre, Canada. Her studies were generously supported by an Independent Opera Voice Fellowship, a Leverhulme Arts Scholarship, the Countess of Munster Musical Trust and JM Finn & Co. Before beginning her studies at the Guildhall School, Raphaela graduated with a first class degree in English Literature from Clare College, Cambridge.